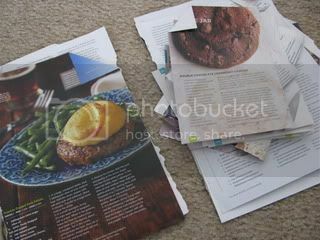 I tore out the recipes and articles that I wanted to keep, then removed the address labels from the magazines. 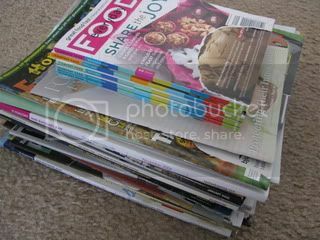 All of these--about half of the original stack--went out for recycling. This is my file of clipped/printed recipes. It really needs to be organized, but since it's hidden in a cabinet, it's out of sight, out of mind. Any ideas? For more Tackle It Tuesday, click the logo at the top of this post. A large binder with LOTS of page protectors! My torn-out clippings got a bit crazy too. So, what I did was when doing my menu planning, I made myself add several from my clippings into the plan. If we liked them then they got added to my recipe box, if we didn't they went in the trash. LOL! !My clippings are all over the place. I got'em on the table, in a drawer, in the cupboard, in a couple of folders!! 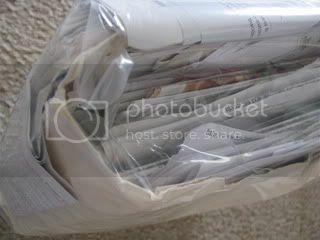 I have a binder for magazine clippings, but I think I'd go through a store's stock if I tried to put them all in page protectors, even though I think they look better that way. Go you!!! 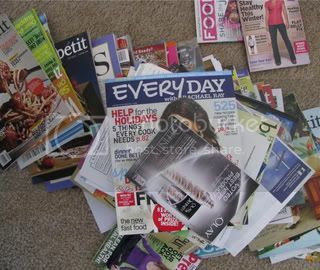 I always mean to do this and then my husband winds up just throwing my magazines away when we have too many lying around - he says we have enough clutter and he is right!! As others have said...I've had good results using a binder with page protectors. When I put them into a file box, I never used them...and many didn't fit in the box. You are inspiring!! I really need to tackle this too. I have been thinking of putting them in folders. based on category of the dish.... but the folders might not be big enough ! Oh wow my dear! You're so awesome!